This 16-inch by 16-inch premium ARTISAN throw pillow is what you get when a Despicable Me Minion watches the Big Bang Theory. Minion Kevin, Dave, Stuart and Tim take on Sheldon, Raj, Leonard and Wolowitz in a hilarious play on the television sitcom. The popular sitcom is about two physicists, an aerospace engineer and an astrophysicist whose geekiness, intellect and social awkwardness contrast with the social skills and common sense of their aspiring actress neighbor — a hilarious combination when matched with those giggling, crazy Minions. On a bright medium blue background, favorite Minions are featured dressed as Big Bang characters — Minion Howard with his bowl-style haircut wearing a loud 1960s-era outfit — Minion Raj wearing a layered combination of a shirt and sweater vest — Minion Sheldon is dressed in a vintage superhero “Flash” T-shirt and Minion Leonard in his iconic sweatshirt jacket. Accent colors in shades of red, yellow, blue, black, white and brown provide plenty of opportunities for this throw pillow to coordinate with other colors in room accessories. This Minion Big Bang Theory throw pillow is also available in 18×18 inch and 20×20 inch sizes as well as WITH and WITHOUT the pillow insert. This can be purchased as a blue pillow cover only with a choice of INDOOR or OUTDOOR spun polyester poplin fabric. You can choose your size and type HERE. Inside this crisply detailed, colorful 16-inch by 16-inch novelty pillow is a hypoallergenic down-alternative insert that mimics the qualities of down — but with all the comfort of loft as well as easy maintenance. The pillow insert is double stitched for quality and over-filled for long wear. Decorating with throw pillows in bright colors on a tightly woven fabric like poplin can add just the right splash of color to brighten any room and come in handy when you need just a little extra cushion behind your head. 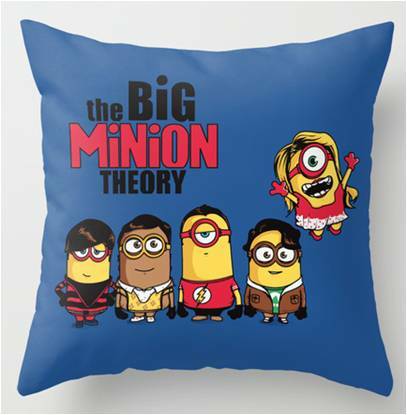 This is a unique 16-inch by 16-inch ARTIST DESIGNED throw pillow that combines with wide-eyed wonder of the Despicable Me Minions with the higher intelligence of favorite Big Bang Theory characters. INCLUDED with this decorator, character themed pillow is a zippered, removable pillow cover and a hypo-allergenic down alternative pillow insert. Featured are the goggled-wrapped likenesses of favorite Despicable Me Minions outfitted to resemble Penny, Sheldon, Raj, Wolowitz and Leonard in an artisan design on BOTH SIDES of the pillow cover. This cute pillow cover with insert is made from 100 percent spun polyester poplin making it very durable yet removable for cleaning — it features a convenient, concealed heavy duty nylon zipper. Wash the Despicable Me pillow cover in cold or warm water using a mild detergent. Using bleach is not recommended. Allow the zipped cover to air dry or tumble dry on a low setting. This 16-inch by 16-inch throw pillow is available in 18-inch by 18-inch and 20-inch by 20-inch sizes. It can also be purchased as a PILLOW COVER ONLY, for your existing pillow and can be purchased with INDOOR or OUTDOOR spun polyester fabric. Because this is a PREMIUM artist’s rendering, the throw pillow is made to order and ships in just 3 to 5 business days. Prices will vary based on your selection of Minion pillow or pillow cover size.